Wool Week is here. Friends are in Shetland or down in London having all sorts of woolly fun. For the first time I am not actually involved in Wool Week. The past four years I was on the front-line at various events: talking to people about the wonderful qualities of wool, explaining how hand-knitting and fashion have more in common than people think, and emphasising that wool is far more than just lambswool or merino. But I am technically still as involved as ever. This Sunday I am teaching a class on two-hand colourwork, Nordic knitting traditions, and Continental knitting at Edinburgh's Be Inspired Fibres, I am also busy working on an article about North Atlantic knitting traditions for a knitting magazine and I am working on no less than five future designs. So, in a way I am still talking about all those things but at my own pace and in my own way. It feels good. I cannot resist still dressing the part, though, so yesterday I wore my Orkney cardigan together with my True Brit Knits badge. Every week is Wool Week, of course, but it's still nice to make an effort! Design-wise I am both back doing something I really love and I am stretching my wings a wee bit. I was recently commissioned by Susan Crawford to design a piece for her Knits for a Cold Climate collection. Susan's famous for her vintage-inspired knitwear design and she has given myself and fellow collaborator, Tess Young, a very interesting and very tight design brief. As you may have guessed by the name, it is a collection of designs inspired by the late 1920s/early 1930s and the English novelist Nancy Mitford. I am using Susan's Fenella yarn and the colour palette is just perfect for the period. I have long been interested in early 20th century arts and culture - specifically circa 1909 to 1939 - and I find it a really intriguing challenge to translate my knowledge of this period into knitwear design. Intriguing and fun. A bit like the design I am working on. Finally, the Edinburgh Yarn Festival has announced their line-up of classes. I am really, really, really proud to see my name in a line-up international names as Helene Magnusson, Nancy Merchant, Veera Valimaki, Martina Behm, and Carol Feller as well as local luminaries Rachel Coopey, Hazel Tindall, the very, very lovely Kat Goldin/Joanne Scrace crochet duo, and Ysolda. Stallholders will be announced later this year - judging by the size of the new venue and some of the whispers I have overheard, it looks as though Jo & Micha has upped their game significantly. I am really, really proud to be a small, tiny part of this - and with In The Loop 4 lurking, 2015 could be a really great year for hand-knitting in Scotland. 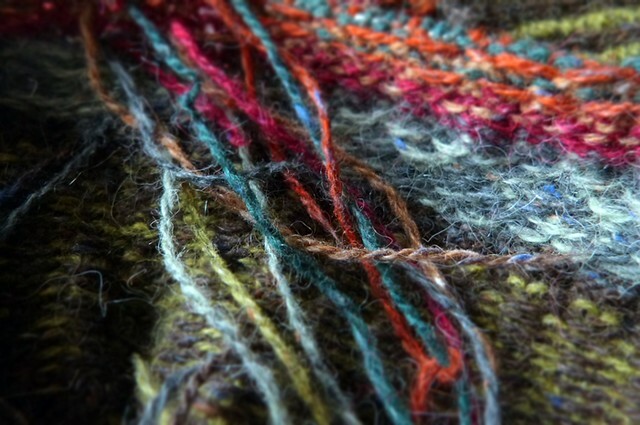 It is Wool Week here in the UK and as a result my working week is somewhat frantic. This year the emphasis seems to be wool as fashion and that ties neatly into some blog posts I have been working on. Wool School asked budding fashion designers to design woolly jumpers with the best designs being snapped up by retailers. It is a different approach to previous years' campaigns which were more focused on wool as product. I applaud the decision to shift focus - it cannot not have been an easy decision - and hopefully by asserting wool as fashion we can start to have that particular discussion. More on this when I get a chance to post my blog series. The Knitter features my Doggerland collection this month and I was slightly stunned to find myself sharing a page with Steph Pearl-McPhee, Alana Dakos, Jean Moss, and Kaffe Fassett. No pressure, Karie. However, that does bring me to what's going on with Doggerland. The next pattern is a 4ply shawl called Vedbaek - I really love it and it's a real comfort knit. The trouble is that I have about six or seven strings to my bow and I am a bit overwhelmed with work. So, Vedbaek is sitting 75% finished on my harddesk and I am as frustrated as everybody else that I cannot just dig into it and get it published. Hang in there with me. Besides Vedbaek, there are two more Doggerland patterns to go. I cannot wait to show you. But at least being busy and travelling gives me time to do some work knitting (see photo!). I finished knitting my Bute cardigan (or did I? Oooh, there's a story..) and I began knitting Orkney. It is going to be a long-term project because I'll only be able to work on it now and then - but it is so pretty. I am changing the colours completely: from the beige/purple/turquoise original to a darker, more muted version in brown/green/red. Ravelry is full of wonderfully reimagined Orkney cardigans: Doodle's Orkney, Grebe's Orkney, Pletynka's Orkney, and Whitecotton's Orkney. I am blessed to be able to spend a bit of my work time of knitting - I don't think I will have time to do so going forward, though. We are coming to the end of Wool Week and I am exhausted. I have been talking knitting, sheep, heritage, yarn, textiles, farmers, design and history for so long that I am hoarse and my body hurts. I do not know what else I can say that I have not already said. So many words. So many kind, interesting people. Alas, we have also reached the conclusion of the series of workshops on Textiles and the Economies of Craft in Scotland organised by the University of Glasgow. I gave a talk yesterday about the knitting industry and the resurgence of interest in hand-knitting. The Q & A was really interesting and I personally took a lot away from the other talks too. Over the next few days I will be posting a short series of blog scribblings about knitting, textiles, material culture and social media. Hopefully you will find them interesting too.